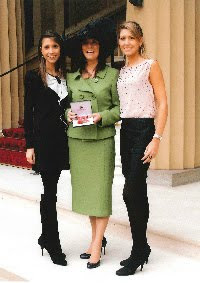 The Founder of two Midlands heart charities has collected her MBE at Buckingham Palace. Trudie Lobban, who started the STARS charity from her kitchen table in 1993, was given the award in the Queen’s Birthday Honours list earlier this year. She started the charity after her younger daughter was diagnosed with a little-known heart rhythm disorder, Reflex Anoxic Seizures, aged four and she could find nowhere to turn to for help. Since then, the charity, based in Stratford Upon Avon, has grown to become international, with a division in the US. In 2004, Trudie launched a campaign that succeeded in changing a government health policy. The campaign brought about the inclusion of heart rhythm disorders, or arrhythmias, into national standards for coronary care with the aim of improving diagnosis and treatment for all people with irregular heartbeat conditions. Trudie is actively helped in her charity work by her daughters, Charlotte and Francesca who are both now adults. Charlotte has almost completed training to become a doctor herself. The charities employ 16 staff, mainly in Stratford. Trudie’s husband, Charles, who worked tirelessly alongside Trudie since she started STARS will be especially missed today. He passed away suddenly last year, ironically from Sudden Cardiac Death, before her MBE was awarded. Congratulations to Trudie and I wish her a very merry Christmas with her family. PS if you're in the Midlands, she is soon to be featured in the Birmingham Post women's section.